Content Solutions is looking for Games Designer, Games Programmer, Illustrator, Multimedia Designer, 2D & 3D Designer, Animator Designer, Instructional Designer, System Network Engineer, IT Executive and IT Technician. Content Solutions is involved mainly in creative content solutions and services, animation for tv and educational games among others. Please submit your resume to maria@in-fusion.com.my or contact 03-27118338 for details. Thank you. We need sharp and innovative programmers to build our upcoming titles, working with the highly advanced “Sliepner” game engine. This is a full time exclusive contract position working on fully funded AAA casual games. We need a contract developer to be our “go to person” for developing and maintaining the Boomzap websites. This is a work from home flat-rate contract position. We need creative and dedicated casual game designers to imagine, build, and test innovative gameplay for our upcoming titles. This is a full time exclusive contract position working on fully funded AAA casual games. – University degree preferred, but not required. We are accepting candidates from anywhere in the world. These are work from home positions – we do not relocating staff. Boomzap is an equal opportunity employer. and contact us at resumes (at) boomzap.com if you’re interested! Sherman3D is hiring Malaysian Pixel Artist for a Nintendo DS game project. They need the artist urgently. Sherman3D is a top game development outsourcing studio in Malaysia.Check out their website at www.sherman3d.com. This event organized by Career Fair Team 2007 which aims to create opportunity for fresh graduates who will soon step into the working atmosphere. Any companies from government to private sectors are welcomed to join this event. We will provide a venue for the companies to meet ambitious and promising students who seek positions in Malaysia after obtaining education and training in an elite tertiary institution in Malaysia. 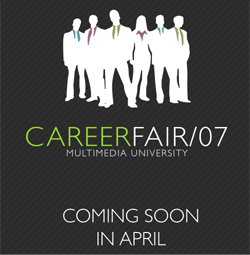 Career Fair in 2007 will portray a different outlook and perspective. 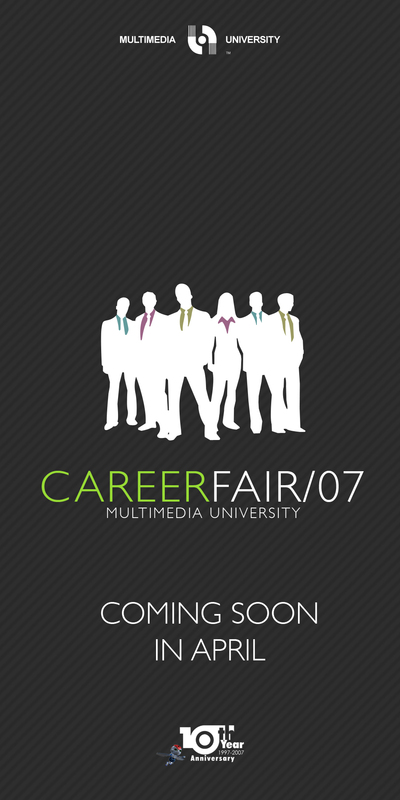 It is a great opportunity for the students of Multimedia University to get closer to various firms and corporations. RiotHQ is the recent winner of the MSC Malaysia Computer Game Design Competition 2006. Key parts: Programmer will spend the most time fighting DarkBasic and organizing the project around the AI. Fulltime preferable though willing to discuss. Candidates must be at a fairly advanced level and must send examples of work they’ve done or online portfolio. 2) Also looking for any students who are familiar with unreal script / unrealed who are interested in doing a mod project freelance.